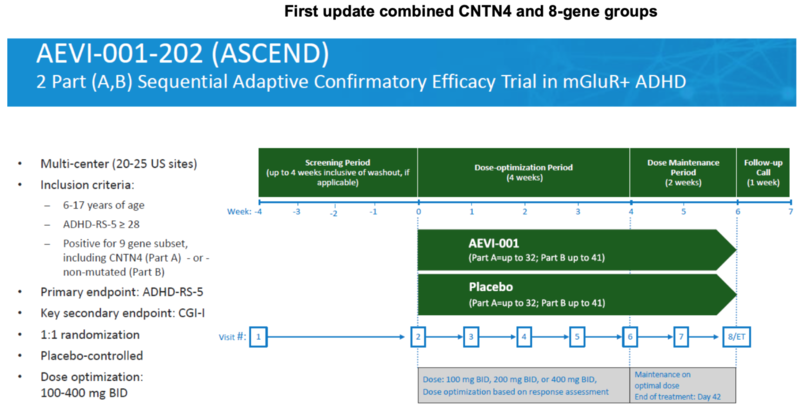 On January 2nd Aevi (NASDAQ:GNMX) announced that ASCEND, the phase II trial evaluating their non-stimulant glutamatergic neuromodulator in pediatric and adolescent subjects with ADHD, failed to meet its primary endpoint of a statistically significant reduction of ADHD-RS at 6 weeks in either Part A (mGluR+ subjects) or Part B (mutation free subjects). AEVI-001 was safe and well tolerated. As we have consistently stated in our coverage, given the largely positive results of SAGA and enrichment of ASCEND with only patients with mutations to nine select genes in the mGluR network, along with a pediatric weighting, we had expected ASCEND would prove successful. As such, we are surprised and disappointed by the news. As a reminder about SAGA’s results (see link to our report), it did meet statistical significance on the CGI-I secondary endpoint as well as on the ADHD-RS responder measure (prespecified as decrease of ADHD-RS score of 30% or more, which is considered a clinical response). Additionally, the ADHD-RS inattention subscale (i.e. the 9 questions related to inattention), just barely missed statistical significance (p=0.0515). And finally, it met statistical significance on the ADHD-RS primary endpoint in the subset of patients with mutations to one of nine genes (in the mGluR network) – this subset is what defined ASCEND’s patient population. Aevi’s announcement earlier this month did not provide detailed results, including what the outcomes were of the secondary endpoints; CGI-I, ADHD-RS inattention subscale, ADHD-RS responder and CGI-I responder. The company did note that, following a full review of the data, that they will “consider their options.” Also, further down in the press release, they mention that the company “remains committed to the development of AEVI-001 as a potential treatment for a sub-population of ADHD patients with genetic mutations that disrupt the mGluR network”. That second quote is interest-piquing in our opinion as it may imply that details within the ASCEND results indicate that there may have been a treatment signal, despite the miss on ADHD-RS. We preface our comments here with a disclaimer that we have no particular insight into what management’s next steps may be for AEVI-001 and that what follows is pure conjecture on our part. 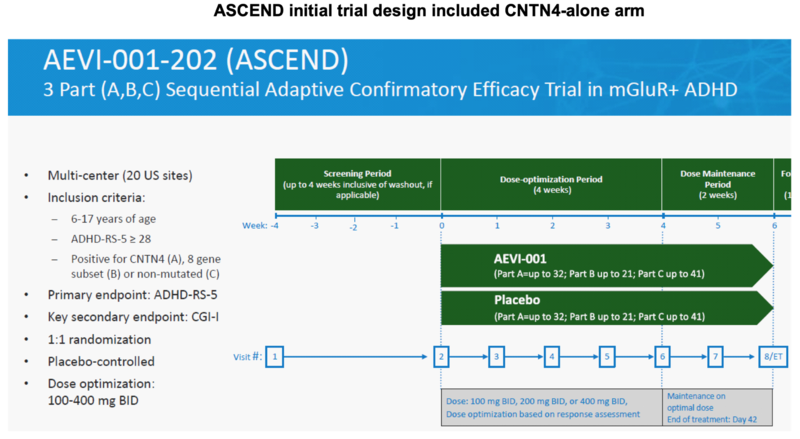 If the full results of ASCEND fail to be definingly informative as to a more promising alternative development path forward for AEVI-001, we wonder if the CNTN4-alone population may represent an option. Approximately 10% of all pediatric ADHD subjects have a mutation to one of the nine mGluR genes studied in ASCEND, including ~5% that have a CNTN4 mutation. This implies that ~50% of the ASCEND population had a CNTN4 mutation, and these children, as evidenced by results of SAGA, show a particularly strong response to AEVI-001. system. Along with commonality with ADHD, it has also been implicated in playing a role in Autism Spectrum Disorder (ASD). AEVI presented compelling results from the CNTN4 gene subset of SAGA at the World Congress on ADHD in April 2017. Reduction of ADHD-RS (i.e. primary endpoint) among the 6 patients in this subset (i.e. CNTN4 CNV) treated with AEVI-001 was 20.8 compared to 8.9 among the 12 patients receiving placebo. Despite the relatively small sample size, the difference was statistically significant (p = 0.03). The percentage of responders (i.e. one of two key secondary measures), as measured by the number of patients in each arm that achieved 30% or more reduction in ADHD-RS score from baseline, was also highly statistically significant among this CNTN4 gene subset and also improved as compared to the unparsed data (i.e. results incorporating data from all study participants). 6 of 6 patients, or 100%, treated with AEVI-001 among this CNTN4 subset met the 30%+ responder endpoint compared to just 3 of the 12 patients, or 25%, receiving placebo (p = 0.0027). The CNTN4 subset also met statistical significance on the CGI-I secondary endpoint. Five of six patients, or 83%, treated with AEVI-001 among the CNTN4 subset achieved a CGI-I score of 1 or 2, compared to 2 of 12 patients, or 17%, receiving placebo (p < 0.01). 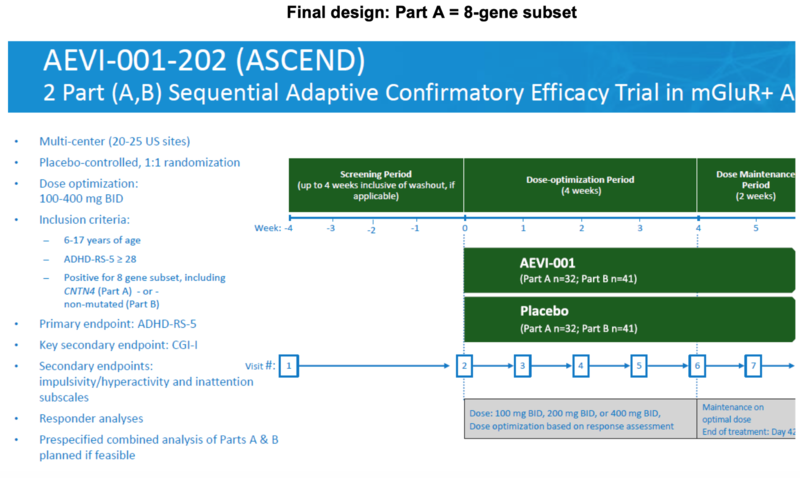 SAGA’s CNTN4 results were so compelling that the initial design of ASCEND included these patients (i.e. those with a CNTN4 mutation) as a separate treatment cohort. As a reminder, the initial design (below, from Aevi’s August 2017 investor presentation) of ASCEND included three Parts: A = CNTN4, B = 8-gene subset and C = non-mutated. The design was subsequently modified, combining the CNTN4-alone arm with that of the 8-gene subset (creating a 9-gene group). It was not clear what the reason(s) was for eliminating the CNTN-4 cohort, although it may have been to facilitate enrollment. ASCEND design changed again, moving from 9 genes to 8 genes..
ASCEND design was again updated, changing Part A from a 9-gene cohort to an 8-gene cohort. The gene that was dropped was not disclosed nor were the specifics surrounding the decision to do so. We looked back and it appears that this change was implemented around the same time of the June 2018 announcement that ASCEND would continue to enroll to 64 in Part A and 42 in Part B. Our hypothesis that CNTN4-alone could represent a population target for AEVI-001 in ADHD is, at this point, just a guess and based on results of SAGA. It is also supported by the fact that the initial design of ASCEND had isolated CNTN4 as a stand-alone target and the reasoning for the subsequent change, which combined CNTN4 (Part A at the time) and the 8-gene (Part B at the time) cohort into the 9-gene group (the subsequent Part B), was never completely clear. The ASCEND results are surprising given what we interpreted to be a fairly compelling treatment signal of AEVI-001 in the mGluR+ nine-gene subset in SAGA. Design changes to ASCEND were never completely explained and may have confounded results to some extent (which, again, is pure conjecture on our part). Nonetheless, we think that elimination of the CNTN4-alone group in ASCEND and the particularly compelling results of this population in SAGA means that it could represent a potentially viable target and development path forward. The CNTN4-alone population is about one-half of the aggregate size of that of the 9-genes of interest. As an estimated 300k children with ADHD in the U.S. are believed to carry this mutation, this still represents a sizeable potential market opportunity – and one that we estimate could be worth as much as $600M annually. And, with the possibility that a non-stimulant ADHD therapeutic could command premium pricing, it is possible that the market opportunity could be even more valuable. In the meantime, Aevi has indicated that they intend to continue to forge ahead with their other programs, including AEVI-002 in severe pediatric-onset Crohn’s Disease and AEVI-005 a first-in-class monoclonal antibody targeting an undisclosed autoimmune ultra-orphan pediatric disease. Aevi’s most recent guidance was for topline results of 002 to be available around the middle of this year – although that timeline could slip further depending on if there’s any traction on enrolling patients. Aevi expects to use the topline results to decide whether to continue development (via their license with Kirin).